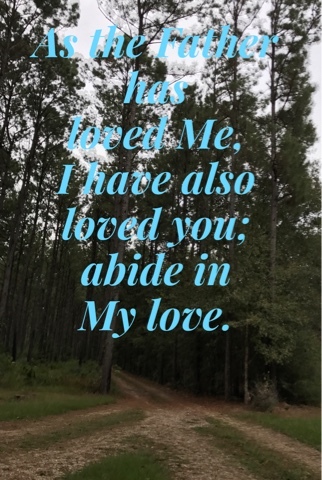 As the Father has loved Me, I have also loved you; abide in My love. My parents gave me a daily devotional book earlier this year. The focus for today reminded me of a similar lesson that my grandmother shared with me long ago. Never alone! With Christ in our life, we are never alone. What a comforting truth. Only God can fill our hearts. Thank you for joining Scripture & A Snapshot. Leave a comment with a verse that God has placed on your heart this week, or leave a link to your own post sharing a Scripture and a snapshot. Take time to visit some of the other links and our group Pinterest board. I love the word abide in this verse. We need to live/dwell in His love! Isn't that beautiful? It is amazing how the truths shared long ago by loved ones still come back to mind. So grateful to have had godly grandparents and parents in my life. Blessings! I love this verse. Abide is actually a verb...which means there is action involved. It is not always easy to abide in His love. Sometimes we have to work to know that we are doing the right thing.